What's the goal for a normal HDL level? How can you achieve this goal? Why is it important? As you may probably know, HDL is the good cholesterol, i.e. that type of lipoprotein which removes the cholesterol from your body. There is a balance for all the things in our life. The same happens for HDL cholesterol levels. In other words the aim is to always get normal level for HDL in your lipid profile records. 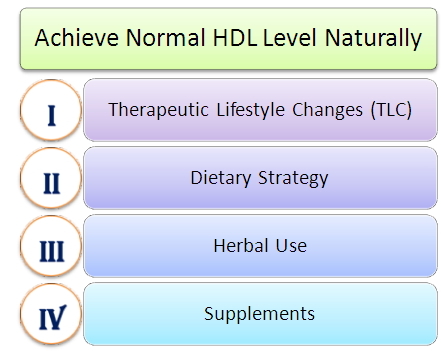 The following chart will give you the idea of what's the normal hdl levels you should aim for. If you have a look at this chart, you can "calculate" the risk level for heart disease based on your HDL cholesterol levels. So, if your HDL level falls under the normal range, i.e. 50 or higher figures, then, you must consider yourself to be safe of any heart disease or other related problems. In fact, this is exactly the figure you should aim for : 50 or higher HDL levels. If your HDL levels are between 40 and 49, then, they are also considered within the safe line. That is, you have low probabilities to develop heart disease. Although it might appear as low risk level, however, it still remains a potential risk for heart disease. So, It depends on how much afford you put in trying to raise HDL cholesterol levels. Meanwhile, if your figures are less than 40 mg/dl (35 for men and 40 for women), you must consider yourself as a high risk population for developing heart disease waiting for the problems to spring out from time in time. In addition, if you have normal ldl cholesterol levels and a level of 35 of hdl cholesterol, you may still consider to have a potential high risk. This means that you should not sleep in peace until you raise your HDL levels up to normal or at least, near-normal range, even though you don't have any problem. You have greater chances for future problems. How can you achieve normal level of HDL? The very first solution you should consider is the Therapeutic lifestyle changes (TLC). The second one include following the right diet strategy. The other manner is by using specific herbs that have been studied for their ability to improve lipid profile, including increasing HDL. If you find it difficult to get all the right herbs and foods to increase HDL, there is still another natural way to get normal hdl level with no single side effects. I'm talking about natural formula you may find in various supplement which can help raise hdl levels, and lower ldl cholesterol at the same time. At least, if you fail to raise HDL cholesterol, your physician will be obligated to prescribe the medications. That will cost your body and pocket, their side effect will have negative influence over your body while their price will get your pocket empty.